We’ve had a few requests lately for some pre-made processes you can assign to a virtual assistant, so I thought I’d take the day to create processes for a whole heap of tasks we regularly need help with here at Process Street. Not only will it help us further systemize our operations, but you get to use the exact processes we use here to scrape hundreds of emails, research the best keywords, stay on top of our mentions, and more. Since these are checklists made in Process Street, you can easily assign them to your team by making a Process Street account and adding your virtual assistants as members. For every time they do the task, they create a new checklist from the template and work through it. You’ll be able to see the progress, and communicate around the steps in the comments to address any problems. You can use these checklists in the app by signing up, or you can simply export them as Word documents. Whichever you think is best. Finding emails is purely a research task, which makes a real pain to condense into a done-for-you app. Using this checklist, however, is a solid start. It guides you through a variety of methods from simple (for easy to find emails) to advanced (for rarer ones). You might want to find emails for an outreach campaign you’re running, or to find one particularly elusive journalist to pitch. Whatever your reasons, here’s what we use internally to find hundreds of emails per day for our database. I recently wrote about driving traffic with social bookmarking sites over on the lovely Mention blog — it’s an amazing source of traffic for us, but submitting content for promotion (whether it’s your content or not) can be time consuming. Below is a checklist you’re free to edit with your own favorite social bookmarking sites, but I’ve added in some example ones we use. To get the best out of it, you can fill in the form fields with the post data and select where the content should be posted. That way, it’s easy for anyone coming into the checklist to see what they’re expected to do. Mention (double shout-out, woo!) is what we use to notify us when we get new backlinks or mentions from other blogs. If you promote posts that link to you, there’s a quick routine you can do every morning to get these links out of Mention and into your database so you can run them through your content promotion process. Since when other blogs mention you, you get free referral traffic, it’s best practice to help them rank for their target keyword by linking back to them in your posts. Since the link is coming from another domain, the SEO benefits are much larger than if they were to link internally. Now, here’s a daily mention tracking checklist you can assign, to make sure you’re promoting content that links to you, and retweeting people kind enough to share your posts. If you’re doing any kind of influencer outreach for product launches or content promotion, Buzzsumo is a phenomenal tool. At Process Street, we use it to quickly create lists of publications to pitch, and to send review copies of our ebook to the right people who are likely to be interested in what we’re writing about. Buzzsumo is basically a database of blogs and influential people that you can filter by category. If you knew the 100 most influential bloggers who are interested in workflow automation, for example, you’d be able to send 100 targeted emails and ask them to promote it for you if they like it. Unlike content creation, broken link building is less creativity and more data entry. It involves using a number of tools to gather data, formulating that data into a spreadsheet and then sending email templates. 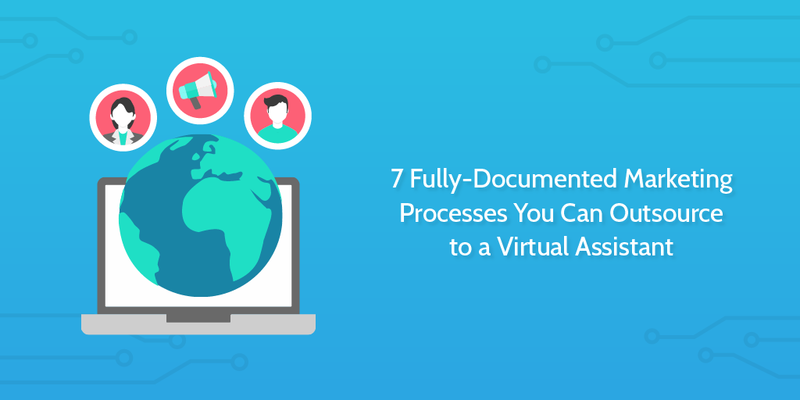 If these aren’t your favorite kinds of things, you can easily outsource the process to a virtual assistant with these 2 fully-documented processes. If you have a stream of guest submissions coming into your blog, you might find that your writer spends more time getting them ready than writing new content. Formatting posts into WordPress and making sure they abide by your standards is another process you can train for and delegate. Here’s a process we use here at Process Street to make sure that our accepted guest post submissions are ready to go. We also use it to make sure we’re keeping the author in the loop about the status of their hard work. It often takes two pairs of eyes (at least) to shape an article into the best piece it can be. Everything from on-page SEO to a highly clickable headline, recalling every item to check from memory simply isn’t viable. Instead, use this 23-point peer editing checklist to make sure your post is totally watertight and optimized before you publish it. Thanks for reading! I hope you found some marketing processes here you’re now able to outsource. If you want to use these processes inside Process Street, just sign up for a free account now and get started. Did I miss anything you’d like to see? Let me know in the comments and I’d be happy to make it. Sure, Jennifer! Glad to hear it. Which processes are you planning on using?